The old ‘W’ shows the passage of time. 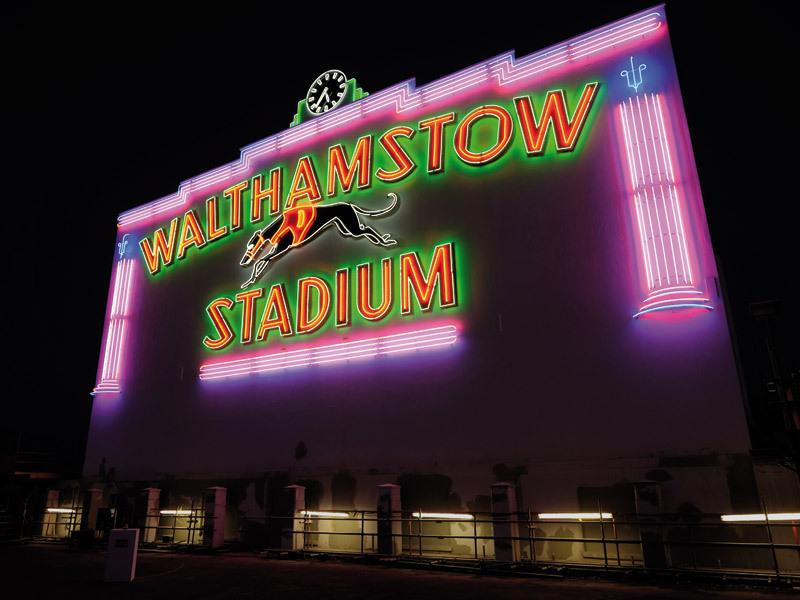 While the greyhound stadium site may have seen its last race with its redevelopment into housing, the art-deco facade and neon sign have been retained and restored. 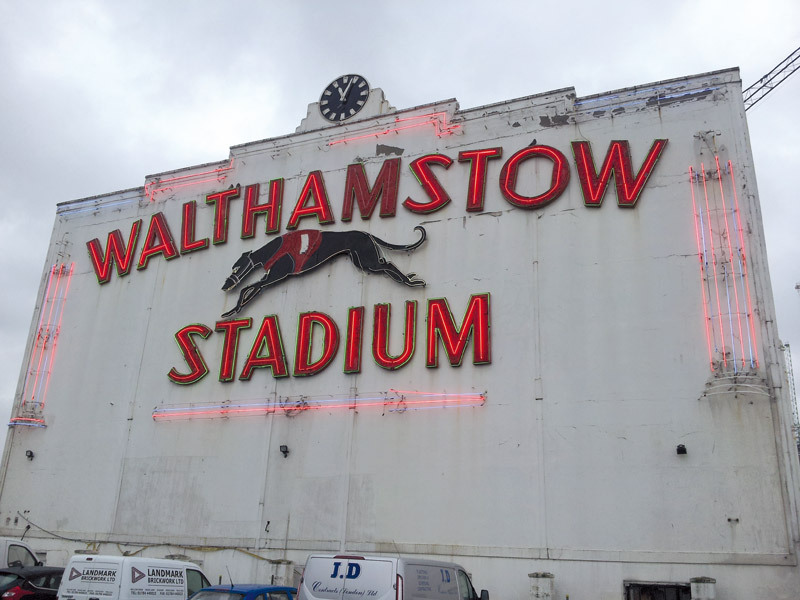 Ask the long-term residents of north-east London about their memories of Walthamstow Stadium and many will respond enthusiastically. 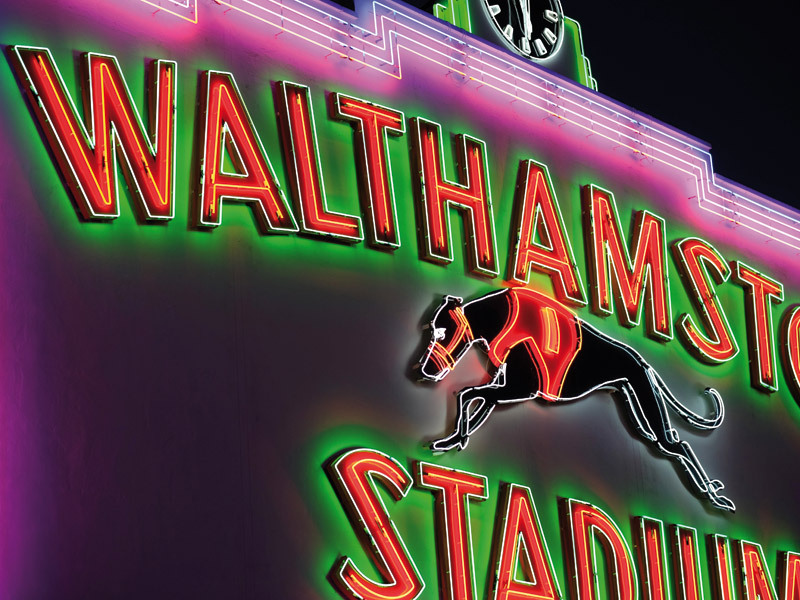 Apart from racing greyhounds -- for which purpose the stadium was built in 1933 -- older generations will also recall the rip-roaring nights watching speedway and stock car racing there in the late Forties through to the mid-Seventies. In 2008, the stadium closed after a long and continual decline in visitor numbers 'going down the dogs' and its fabulous if tired-looking neon lights switched off on the art-deco entrance. For eight years the iconic neon facade remained in darkness and, with Wathamstow's housing boom bringing new residents to the former gritty East-End location, the demand for housing turned its gaze towards the 32,300 sq m vacant site. The stadium had been a much-valued feature both locally and nationally, familiar to many through the unmistakable neon sign featuring in pop videos and films. The entrance has been described as being one of the 'finest quality' examples of art-deco architecture in England, and it fell to architecture practice Conran and Partners to sensitively restore the Grade II listed feature as part of the site's major redevelopment. 'The preservation of this iconic building was central to our design vision, and we are thrilled to see that it will feature on the site for future generations,' says Victoria Whenray, project director at Conran and Partners. The facade's restoration is now completed and fully illuminated. 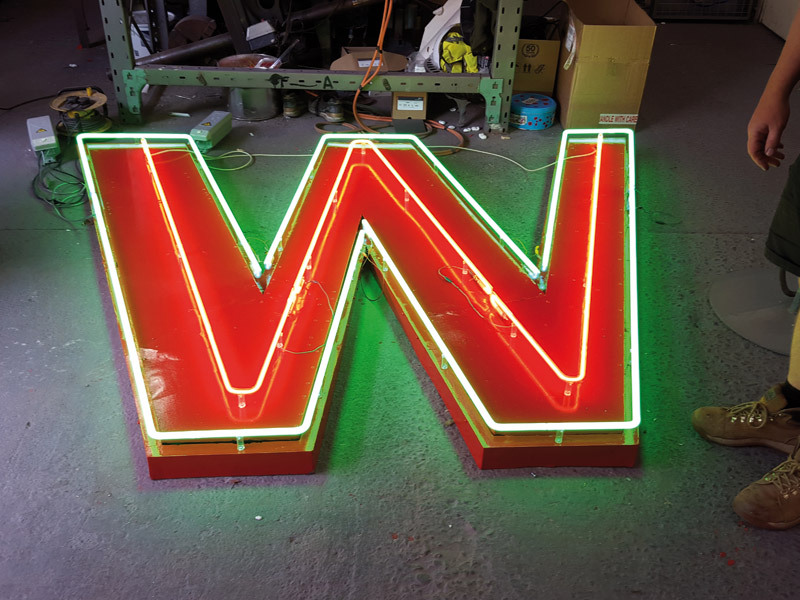 The practice commissioned local craftsman Andy Cook, of Linton Signs, to do the building's neon restoration at his workshop in nearby Chingford. For Cook, it is something of a homecoming -- he first worked on its repairs 20 years ago as an apprentice. The old 'W' shows the passage of time. There are no ready-made tools for neon crafting, so nearly every tool is made on the job, usually from scrap bits of metal. Cook doesn't use protective wear either as it is cumbersome; he says he has to 'hold and feel' the glass. Skilled (and hairless) hands are years in the making and it takes up to 15 years for a glass bender to perfect an exact 90-degree angle. 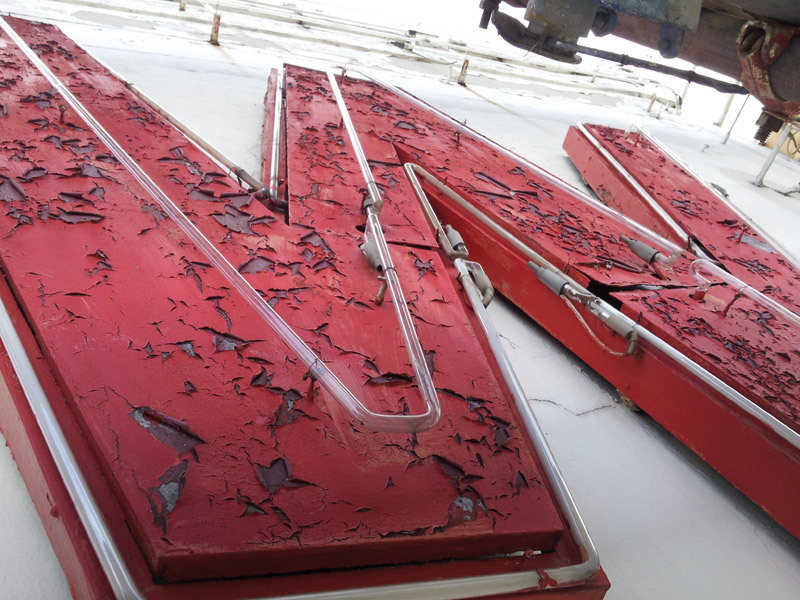 But despite the immense size and intricate detail of the Walthamstow sign, Cook spent a remarkable seven months making and installing the new and restored neon. Conran and Partners' concept and vision for the stadium site will create 294 homes, plus a preschool nursery, allotments, newsagent and cafe, with the first phase of homes ready to move into this year. The Tote board on the reverse of the facade, which was used to display information about races, has also been restored. And the kennels at the back of the site will also be retained and used as sheds for the onsite 'pocket allotments'. Controversy has surrounded this project, with some local groups campaigning for the return of the site to greyhound racing. But planning permission for developing the site was granted in 2012, and Conran and Partners are under the watchful eye of many critics. With 'gentrication' being used to describe many London redevelopments, this project too aims to sensitively restore rather than replace, with the practice recognising value in material.